Morning friends from another day in dull old Barnsley. Well my mum said fathers day was was this weekend and my hubby said it was the week after so I went for week after, well it's not so I thought I better get cracking as I,be about 4 to make. Here is my first one I hope you like it. wow love it and fab colours. This is fabulous Lyn, I love this LOTV and the colours and layout are superb. Great card, cute image and the colours are good too. Did you 'handwrite' the sentiment? A brill card and stunning colours. Lovely little card, and a cute image. Beautiful cards...such cute images...thanks for joining us this week at TPS…..and good luck…. 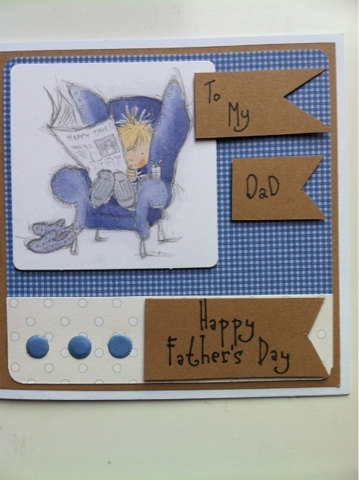 Fabulous Father's Day card Lyn, adorable image...Thanks for joining us at Fab'n'Funky this week and good luck with the DT call.